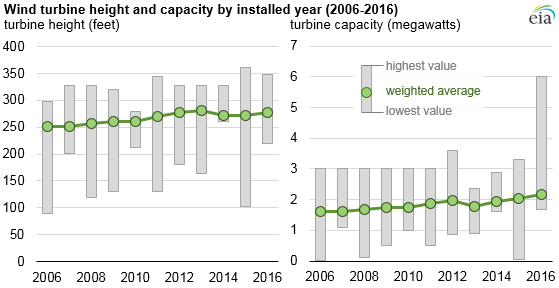 Wind turbines in the United States have grown in both average height and capacity over the past decade, according to data on utility-scale electricity generators collected by EIA. Wind turbine capacity is based largely on the length of the blades, and taller turbines are able to not only have longer blades, but they also can take advantage of the better wind resources available at greater heights. Wind turbines accounted for 8% of the operating electric generating capacity in the United States in 2016, surpassing hydropower as the renewable technology with the largest installed generating capacity. However, because of the way wind and hydropower electricity generators operate, hydropower still provides more electricity than wind does, totaling 7% and 6% of the U.S. total, respectively, in 2016. Electricity generation from wind is not expected to surpass that from hydro in 2017 or 2018 based on forecasts in EIA’s latest Short-Term Energy Outlook. The largest turbines currently installed in the United States have generating capacities of 6 megawatts (MW). These turbines are part of the Block Island Wind Farm in Rhode Island, the only operating utility-scale offshore wind turbines in the United States. Two offshore wind farms are planned to come online in the near future: the Icebreaker Offshore Wind project on Lake Erie near Cleveland, Ohio, in 2018 and the Coastal Virginia Offshore Wind project in Virginia in 2021. The largest onshore turbines in the United States are in Texas, with capacities of 4 MW each. One of the world's largest wind farms is also in Texas: the Horse Hollow Wind Energy Center has 420 wind turbines spread over about 47,000 acres. The project has a combined electricity generating capacity of about 735 MW. Turbines are taller now than they were in previous decades. 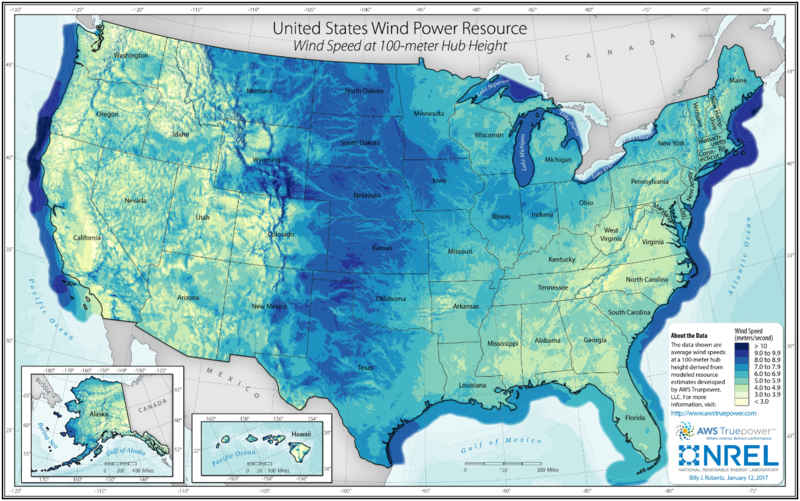 Since 2012, the average height of wind turbines installed in the United States has been about 280 feet, or 80 meters. Before 2006, few wind turbines were as tall as 280 feet. 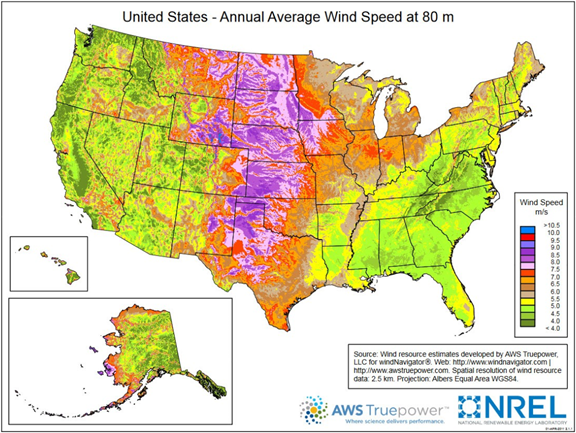 Wind speed typically increases with altitude and increases over open areas without windbreaks such as trees or buildings. Favorable sites for wind turbines include the tops of smooth, rounded hills; open plains and water; and mountain gaps that funnel and intensify wind. 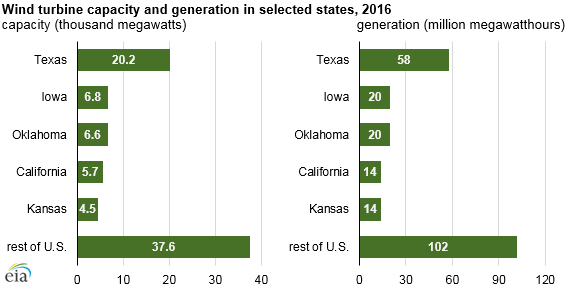 In 2016, 40 states had utility-scale wind power projects, with the most generation in Texas, Iowa, Oklahoma, California, and Kansas. These five states combined produced about 55% of total U.S. wind electricity generation in 2016. Additional detailed information about wind turbine heights, capacity, and other characteristics is available in EIA’s recently released annual survey of utility-scale electricity generators.